It’s finished! 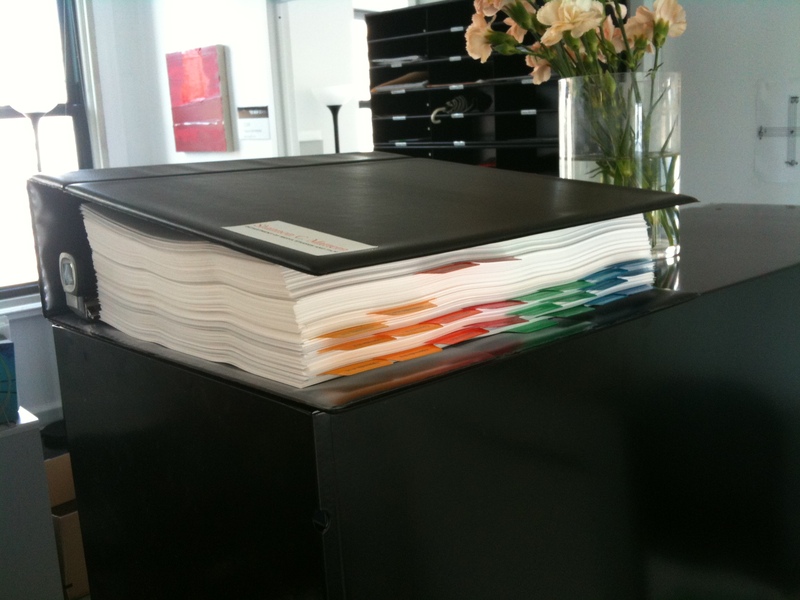 4410 pages, 140 dividers, 5 three-ring binders, and 5 flash drives. 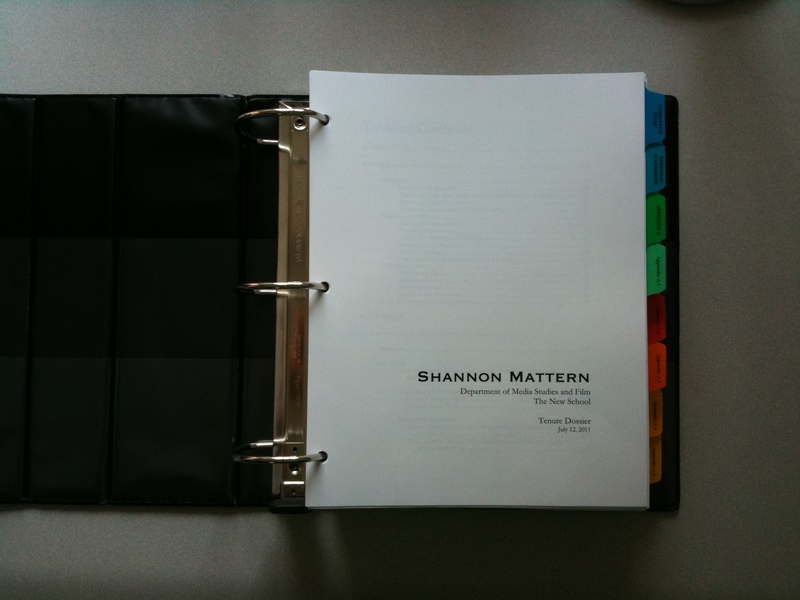 It’s a little less aesthetically daring than I would’ve liked — largely because my color printing necessitated heavier-weight paper, which meant I was sized out of the 3″ binders. 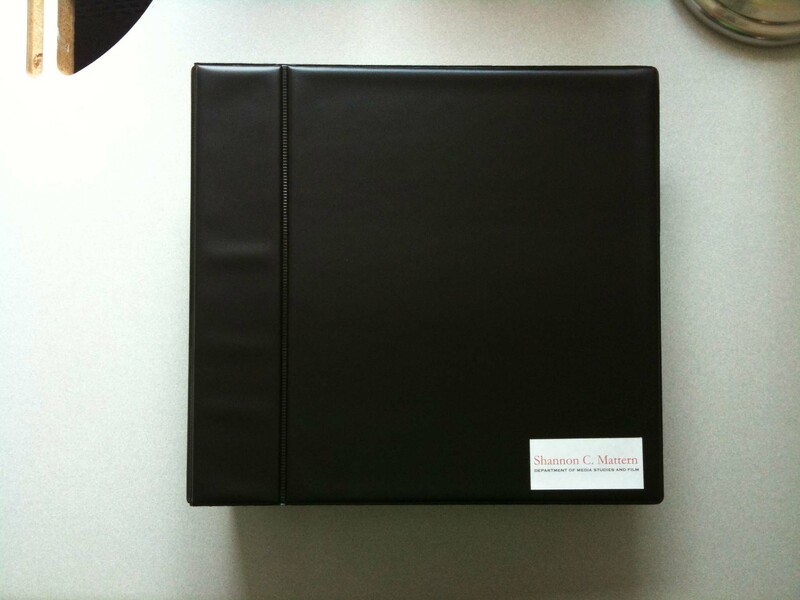 The world of 4″ binder options is, sadly, quite limited. Oh, the minutiae that have consumed my thoughts for the past couple months. I had also hoped to create an entirely-online version of the dossier (à la Kathleen Fitzpatrick), but it turns out The New School isn’t yet set up to accommodate such things. I think (hope?) it’s inevitable that the institution will move in that direction, though. Especially considering the number of faculty in Parsons, Jazz and Mannes (the music schools), and my division whose work is born-digital, or is otherwise hard to squeeze inside a binder, I’m not sure we can keep pushing this paper-based system. I dealt with this issue by including lots of links to my online publications and interactive material; simply pdf’ing and printing this stuff would’ve turned it into something it’s not. I spoke with folks in our Provost’s office and expressed my desire to work with them (assuming they keep me around after all this) to explore interactive dossier formats. For now, though, everything’s out of my hands. All that remains for me is to wait nine months or so while my case works its way through four or more rounds of review. Bright colours play the value along. next to a foldersome / waiter and re letter and read her. My submerged terrarium), and I am luck. Until Death tramples it to fragments. Suffice it to say, I am not a poet. **That’s supposed to be slant rhyme, by the way. Humor me, please.